This movie has a lot of horse info!! Cloud is a wild horse of a different color - almost pure white. And his regal bearing and feisty personality make him stand out all the more. From the day of his birth in the Rockies, he so enthralled Ginger Kathrens that she began to follow his story, filming him and his fellow wild horses of the Arrowhead Mountains over the course of seven years. But in the highly competitive "culture" of wild horses, was Cloud capable of becoming the great band stallion she expected? This first of two films documents the challenges he faces on the way to maturity. He is captured in a government roud-up and released without his family, and battles with other stallions to win a family of his own. When I realized that the third Cloud movie was finally on the pbs website, I knew that this would be more suitable for me to watch to avoid the 2nd transformers movie as long as possible. i watched this on pbs it was AWESOME!!!!! this was great and sad, i learnt SOOOO much!!! i've seen this on opb! it's awesome. until the stallion of the herd kills a foal and lightning kills all the horses. Cloud challenge of the stallions! This is a really good movie! 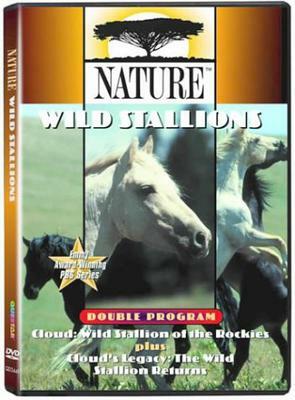 If you want to know about the horses in the wild and less about the ones in movies this is a great one! I watched this on PBS and have been trying to get it from Netflix for about a month! I can't wait to watch it again! I <3 Cloud Flint and Sitka! I almost cried when Dusy died! ALL the wild horses are being threatened by the BLM and Salazar. The Wild horse lovers and movie and singing starts have written to them to no avail and now congress is siding with the cattlemen AGAINST the wild horses. There is going to be a roundup in July (hottest month of the year to eliminate more wild horses and the mares who get to stay are being given Birth control to keep the herds too small to be viable. See www.thecloudfoundation.org for more information and to join in the attempt to save the wild horses. BTW there is now a fence across Cloud's land prohibiting his and the other bands from grazing on the better grass higher up when the grass they are eating dries up! PLEASE write your congressman and see who else you can write to to SAVE CLOUD and other wild horses! I love it! Being a horse loving city girl, I don't usually have an opportunity to stare my eyes and heart out at the regal images of horses. This gave me the perfect opportunity to do so. I was able to watch them just be themselves and come a little closer to understanding them. There is one thing I didn't like: there were some gruesome and rather bloody moments in the film, i.e. dead horse carcass, horse fights that end with blood loss, a foal being killed. You get the idea. But then, that's life! And if you want to get enveloped in their world, totally buy it!!!! I watched this on PBS. It was great, It was like being with cloud a little palimino foal, from the moment he was born. You see him as a foal, a bachelor stallion, and a band stallion. It was a great adventure! There were moments that i cried, moments that i laughed and all i can say is I love this movie.